'Red Line Crossed': Threat Of War By Russia, Iran Fabricated By Media? ‘Red Line Crossed’: Threat Of War By Russia, Iran Fabricated By Media? Numerous U.S. corporate media outlets, headed by Reuters, have over the past 24 hours been reporting a major threat of warfare and connecting it to Russia, Iran, and Syria, in what appears to be a major escalation of hostilities in the wake of the U.S. air strikes on Thursday. The only problem is that the “joint command center” the reports are relying on for the statement, doesn’t appear to exist. Whilst there is a joint intelligence-sharing cooperation agreement between Russia, Syria, Iran, Iraq and Hezbollah in the effort to fight ISIL, it is never referred to as a “joint command center” and is not involved in making public political statements. There is no media statement about the threat from the Ministry of Defence of the Russian Federation as one would expect, particularly given it made a recent statement by its spokesman on the U.S. air strikes on Friday. It also quotes from the Al-Masdar News statement with no question of its veracity and reports on a phone call between Russian President Vladimir Putin and Iran’s Hassan Rouhani, as if it’s relevant to the same statement. We Are Change will seek to monitor the veracity of this story over the coming days, but it currently appears that U.S. corporate media has at best, published a story without thoroughly checking the sources. 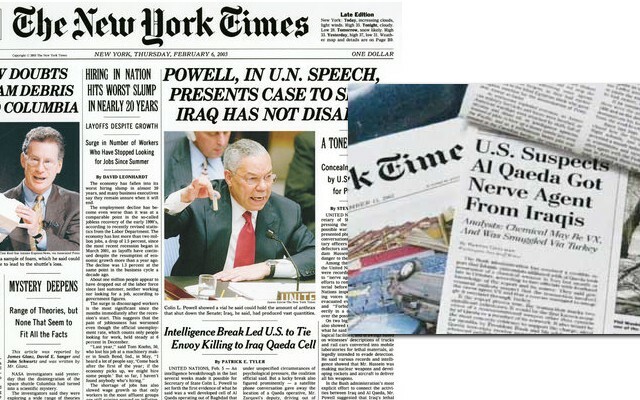 At worst, it is regurgitating its own fake news in a wartime environment, as it did with WMDs in Iraq, increasing the possibility of war between nations.